Here are the reasons why, to date, I am rarely seen in strides in the workplace. I just don’t like the pant suit style, even on professional models. To my mind, Kate Moss, at the top of this post looks less good than usual in a pant suit. To me these outfits say: mass produced Polyester Chinese suits from Next. They are a bit like a man’s suit, but not as nice. These are outfits designed for women at work, who don’t want to wear a tailored skirt. They are supposed to look professional, but they only look anonymous and rather sad – a really washed out version of men’s wear. I can’t bear them and would not be seen dead in an outfit like this. The area that the eye is drawn to is the horizontal line, bordered by the thighs. No wonder two of the models chopped their heads off. However there are ways to wear pants to work that actually look cool, elegant and different. try a waist coat and important blouse instead of a jacket. This will have the effect of elongating and slimming the body. However these models are extraordinarily thin with especially long legs and high heeled shoes. The whole look is exceptionally vertical with hardly any interference with the up-down line. Neat or short hair (or a hat) keep the line clean. vertical stripes (or top stitching or vertical braid) on your trousers are slimming. Beware the naff 3 piece pinstripe look because it is a parody of male dressing. Ha ha..and here I am about to make a wide-legged pale grey trouser suit for SWAP. Thanks, Kate! 🙂 I probably won’t wear the jacket and pants together anyway though and if I do it will be with an interesting blouse. It’s funny – I used to always wear skirt suits and then on the rare occasion that I wore full trousers I got tons and tons of compliments. Not sure what it is. I think it might be that although I’m not hugely tall (same as Kate Moss – five foot seven) my legs are long for my body length. I also have a pair of dark green slim trousers that everyone goes crazy for when I wear them. Love the Stella McCartney suit (hemmed of course) and the velvet one…you are giving me ideas. I think the trick with pant suits is again wearing them with individuality. The ones you point out as particularly offensive (the headless ladies) don’t show off any feature of those women’s bodies to great effect and the platform heels worn with them are icky (those I would not be caught dead in). I prefer jackets with a different cut or vintage shoes with a bit of colour or texture. No one wants to be bland. Well, some people do, I suppose. I mean to write a post about working with mostly men in a traditionally-male type of job, or at least my version of it, and what I’ve experienced. Hmm. I do not care to wear skirts and dresses during the winter season. I find that I get chilled too easily. so for me, wearing pants is of greater priority. but perhaps because I am on the taller side (5’8″), I have been able to come up with some styles that I feel work for me. I like to wear fairly wide legged trousers, with a good amount of drape in them. I like them to be fairly high-waisted, since I am fairly long-waisted. I think it helps balance my proportions. I just finished the muslin for my first jacket. I have in mind to pair my high-waisted, wide, drapey trousers with some fitted, cropped jackets. And I will wear them with drapey silk blouses. I think that wearing the high-waisted pants with a cropped jacket will give the illusion of longer legs 😉 we’ll see how it works for me. In my imagination, it will work beautifully. but sometimes, my imagination doesn’t play out exactly in reality. However, I have always thought that well fitting trousers and coordinating jacket in a quality fabric looks elegant and strong. 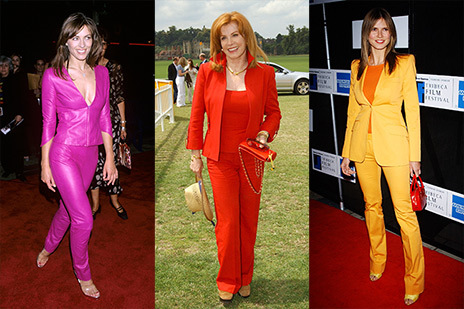 Pant suits…remember when they came in and women were refused entrance into fine restaurants when wearing them? Remember when they were not allowed at weddings? Pants in general were a no-no even in the 60’s when I went to high school football matches. If the nuns caught you wearing pants, you could be expelled! The one thing that made me perk up was the photo of the blue pants suit with the hems touching the sidewalk…nasty looking! Some political folks in the UK and US look like they got dressed in the dark and some of the wives…OMG the wives…my British husband asks me why do they all look so dowdy? Maybe more of them should start reading your posts, Kate? I don’t like trouser suits on women all that much either. I DO quite like wide legged (but snug over bottom and into waist) trousers with a neat fitted shortish jacket – but I would never match the fabric. Plain flecked wool for the bottom half and a really nice tweed for the jacket would be my preferred option. I’m not that keen on heels with trousers either. I think elegant laceups look nice. Sounds like I have similar ideas to erinalter above! !